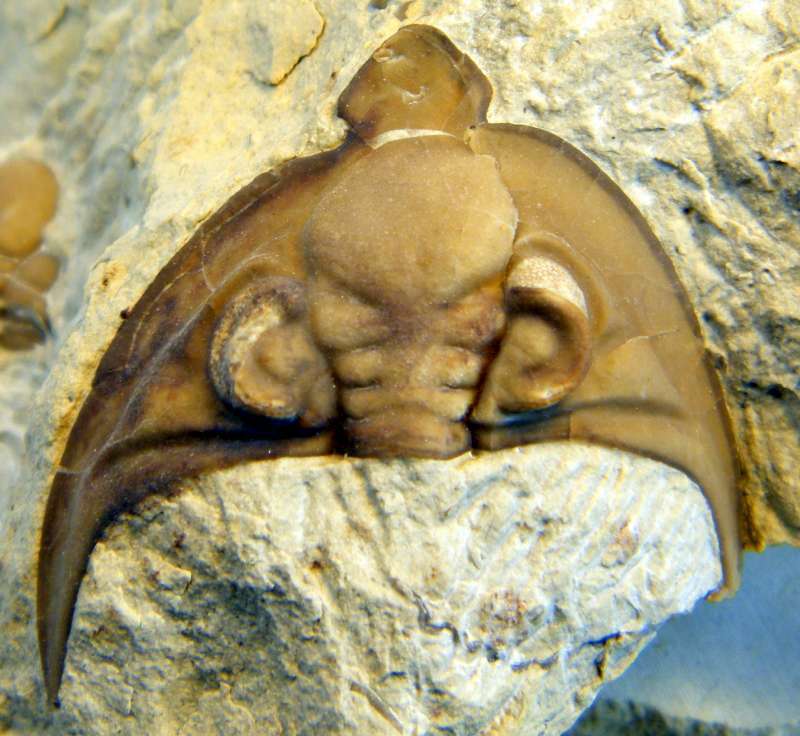 Three species of the genus Huntoniatonia have been described from the Devonian rocks of Black Cat Mountain. However, fragmentary evidence suggests that additional species may be present, so these fossils are in need of additional investigation. Huntoniatonia huntonensis has been found up to 12-15 cm long and fragments suggest even larger individuals were present at various times. The upper three images in the collage below were provided by Steve Marley. 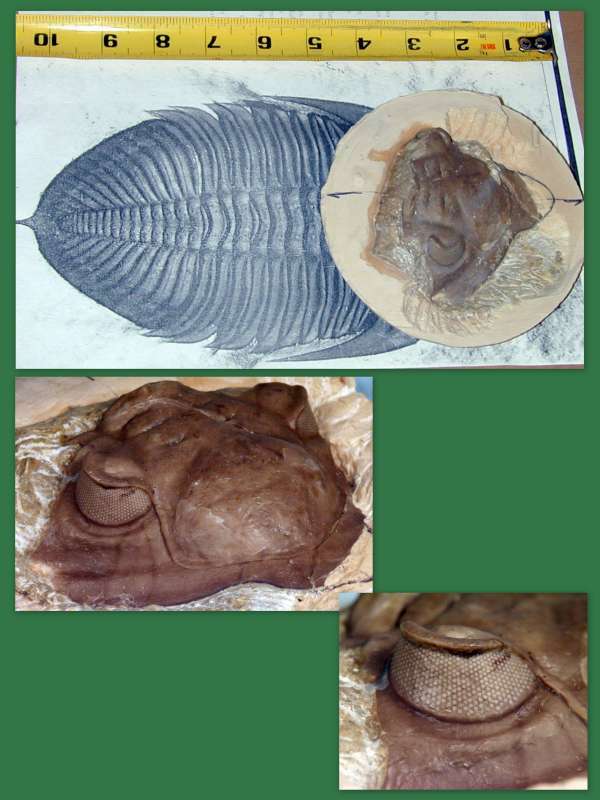 The bottom two images of a cephalic ventral surface with hypostome (left) and a hypostome found alone (right) are photographs by G.P. Hansen. Notice that the right hypostome is ornamented with two distinct furrows running perpendicular to the long axis, while the one on the left is much flatter. 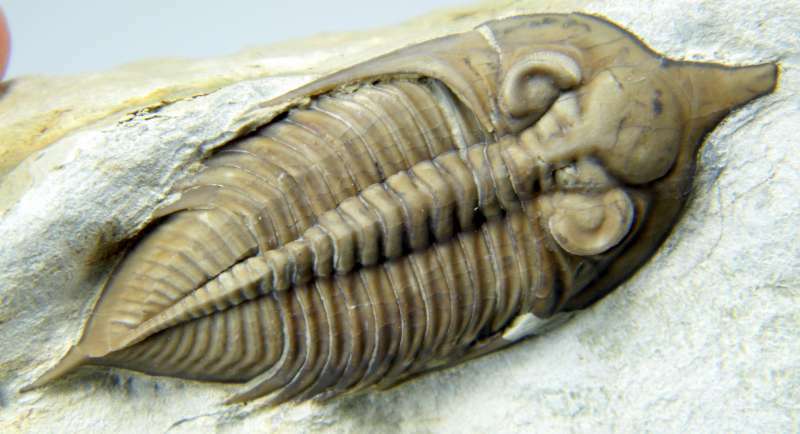 Above is an interesting specimen found by Bob Carroll during the 2010 collecting season. 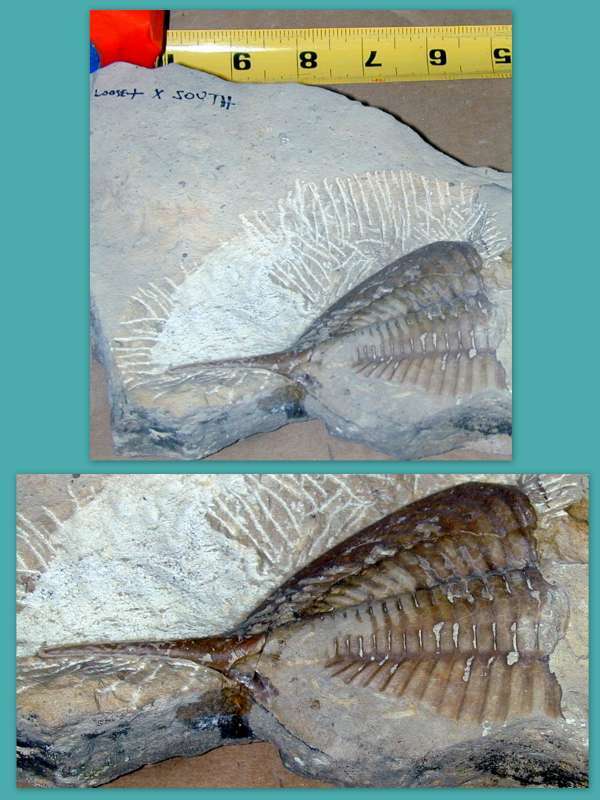 The fossil is oriented perpendicular to the layer and is clearly compressed laterally. Bob's interesting comment about this specimen regarded what specimens like this might teach us about the relative flexibility or inflexibility of the skeletal structure when in life. Huntoniatonia oklahomae. The photographs in the collage below were provided by Sam Stubbs and Neal Immega. 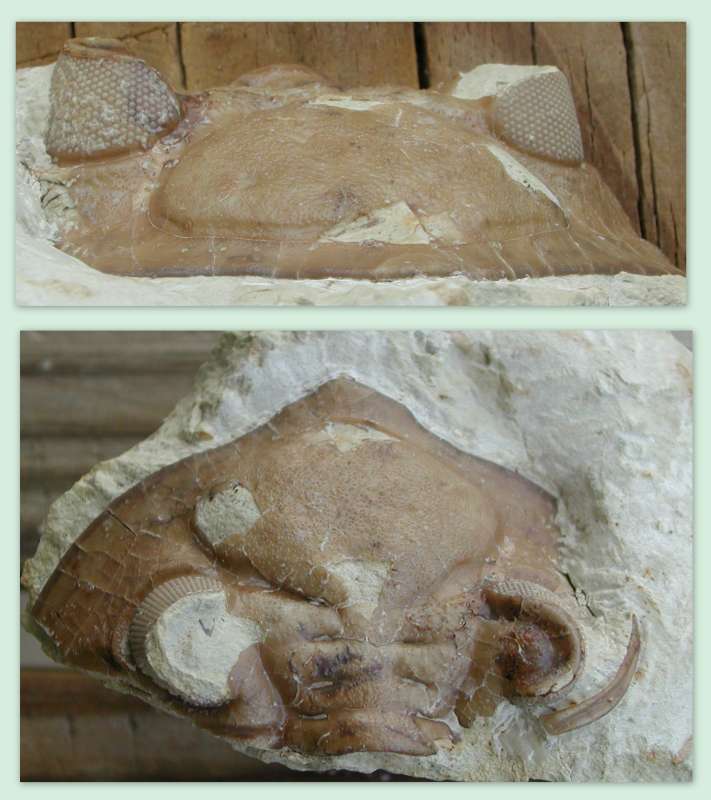 The fragment shown from various aspects and magnifications below appears to be from a specimen of Zlichovaspis syncrama, but this assignment is suspect. 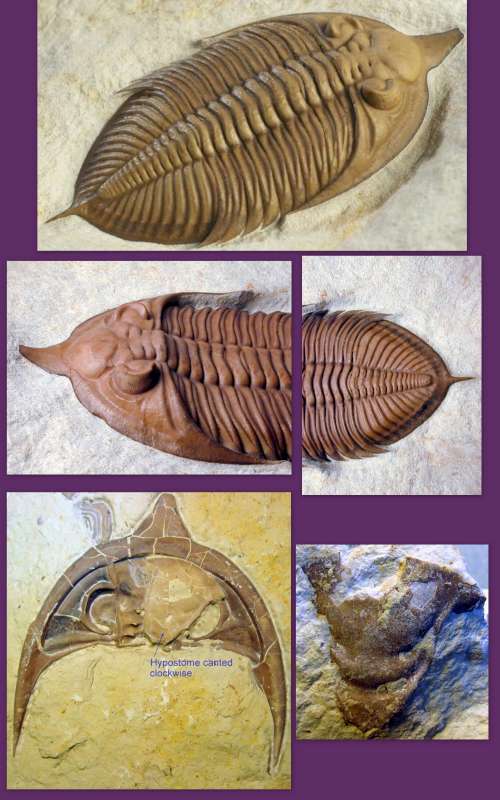 In any event, it was a very large trilobite for Black Cat Mountain as indicated by the photocopy adjusted to the approximate size of the fragment in the following collage. 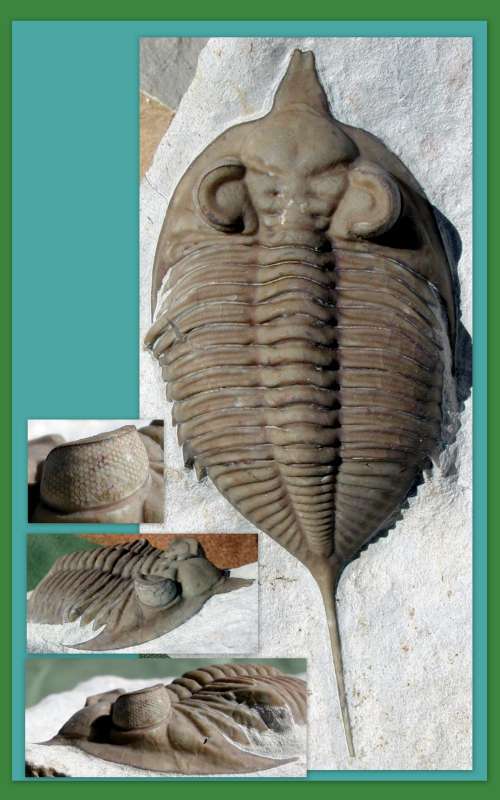 Huntoniatonia lingulifer is normally about half the length (5-8 cm, excluding pygidial spine) of other dalmanitid trilobites at Black Cat Mountain. It is also distinguished readily by the long, delicate caudal spine at the end of the pygidium and the tall, upright posture of the visual surface on its eyes. Below is a collage I composed from photographs taken in sunlight by Bill Rushlau. Below is a nearly complete, pygidial fragment appearing to be H. lingulifer, except that it is very large in overall size and the caudal spine more thickly proportioned relative to its length. It was found in middle to upper Bois d'Arc strata at Black Cat Mountain. New, undescribed species of dalmanitids are appearing from Black Cat Mountain with regularity as unexplored strata are being turned over. Below are two distinct specimens based on the appearance of the visual surface of the eyes on one and the anterior lingual structure on the other. The upper two photographs were provided by Bill Rushlau; the lower photograph was taken by G.P. 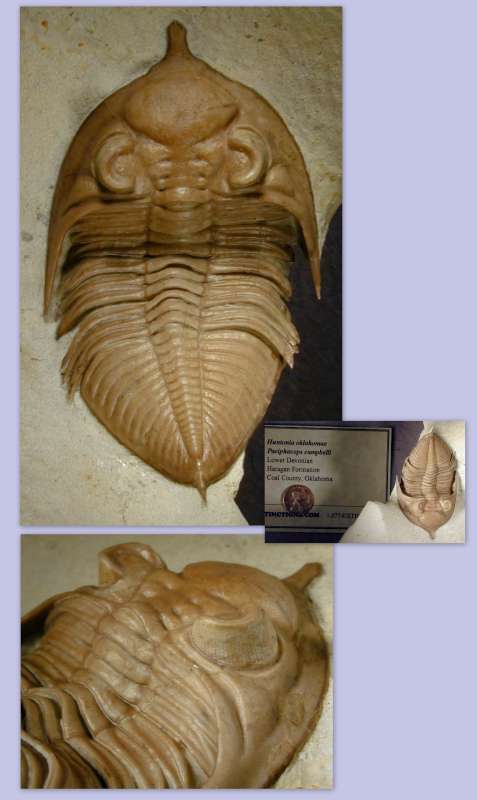 Hansen from a specimen found by Don Campbell.